We are somewhat underwhelmed by the predicted and overdue "storm" so far. There have been only traces of rain. What we are getting is plenty of wind, as we can see from various upturned leaves and trees leaning eastward. Still hoping. It now smells like full-blown Fall. Today, I chopped the last of the cornstalks, and selected an ear to keep for seed, but it is backup. We'll be looking for another variety of sweet corn. Canning some pickled beets and apples and some tomato sauce while dehydrating kale, beet greens, squash blossoms, dandelion and false dandelion greens, and baking a deep dish frittata. For those interested: take one green and one yellow zuke, grated; one large mangel beet leaf including its stem, chopped; one Stupice tomato, chopped; half a dozen duck and hen eggs, a small handful of dehydrated greens, powdered; a bit of olive oil. Salt to taste. Stir/fold all together and pour into a baking dish. Cover with grated parmesan and local cheddar cheese. Bake at about 350 until it looks done -- I think this, which is rather a smallish dish, went around forty minutes. Serve. Beloved likes it, which is a good sign, as I'm an on-again, off-again cook. The runner beans are shelled and the pods went to the compost heap. Ordinarily I just throw them right on the garden but the heap looked hungry. Both the Jenny green beans and the runners were hard hit by drought but they made enough to save about a third for seed and the rest can go into baked beans. I have taken down the burlap shades on the outside of south, east and west windows. The house looks odd with so much light. Buildings are shifting around a bit and I need to trim the bottom off one of the doors. Birds are in the grapes in large numbers; competition is up because everything is dried out. Leaves are curling on the kale, heralding the arrival, later than usual, of aphids. Heavily infested leaves are particularly popular with the hens. Lightly infested leaves do no harm in your meals, but perhaps you should not tell anyone. If, like some, you're not into any aphids at all, switch to the beet or chard greens -- the kale serves as a catch crop for them. Hopefully we'll be back to juicing tomorrow, which is heavier work and needs more of a block of open time. When one lives by the seasons, one lives a bit like a sailor. Hammock time, deck time, and a weather eye. In the improved air I am back at work and beginning apple cidering a few weeks early as the apples are ready. Using multiple varieties creates a more complex flavor and your constituency will prefer the results. I grind ours with a dedicated electric shredder (it's not good for much else) into a bucket and then pour the pulp (about five buckets full) in a clean cloth sack (a large pillowcase will do) and suspend the sack (I use a four block rope pulley and a tree branch) over a suitable container. It's cleaner than it looks, but wash everything before and after and be vigilant. The tub in the kiddie wagon collects the gravity-pressed juice. The sieve over the tub helps keep yellow jackets (valuable allies!) from drowning. They gather around what I'm doing but I move deliberately and calmly, knowing they're not after me. The juice that runs from the sack may be dipped and strained into quart jars and canned. This setup works for pears, blackberries, grapes and other fruits as well. I add anything that takes my fancy to the cider -- this one has a few pears and also quince. I think I'll throw some mint into the hopper as well. We make cider two quarts at a time all winter, boosting with a little bit of honey and wine yeast. Or if we prefer the juice flat, that's good too. This method is not efficient, but it is resilient. Leftover pomace can be used to make vinegar and then dumped at the foot of various orchard trees for mulch and soil amendment; poultry love to pick through the pomace as well. Barn floors full and a little heap under the stairs! At Stony Run, we are no strangers to wildfire. I fought fires in the early eighties, and one of those got up close and personal. We've seen fires occur near here, such as those around Oakridge in the nineties and more recently, and especially the Clark Fire on Fall Creek, five thousand acres, which brewed up a very nuclear looking smoke and steam cloud some twelve miles from here. 2015 is a major fire year in the Northwest, but oddly enough, though we are as dry as a desert nothing of note has (knock on wood) happened in our area. Well, almost. What has happened is a major smoke event. We spent a little over two days hosting what was once Washington and eastern Oregon's forests and grasslands, in the form of tiny particulates at a density of AQI 230. We sheltered in place with the house buttoned up. View across the garden to the far hills, a visibility of about 1.5 miles. View to the south with no sign of the hills in that direction, visibility of about .5 mile! Jasper Mountain, one mile, fading away at about three in the afternoon. Sun at ten o'clock the next morning. On the third day, the smoke began rolling away to the east, giving me a chance to run a few errands. Not that the mask was much help, but the carbon-belching car was. Talk about nested levels of irony. Observe and interact -- after you have pulled up the vines, watch and then harvest when about 80% of the pods have turned brown; otherwise many will split and spill before you get there. Store in a sunny window where rain cannot get to them until all turn brown; provide air circulation. Catch and store energy -- The beans have made nutrients for you and saved seed for next year; the vines are chopped and dropped for sheet composting. Obtain a yield -- Runners are not our most prolific crop in the garden but they are attractive to us and to pollinators, especially the hummingbirds, help provide partial shade, and we use them as a dry bean. 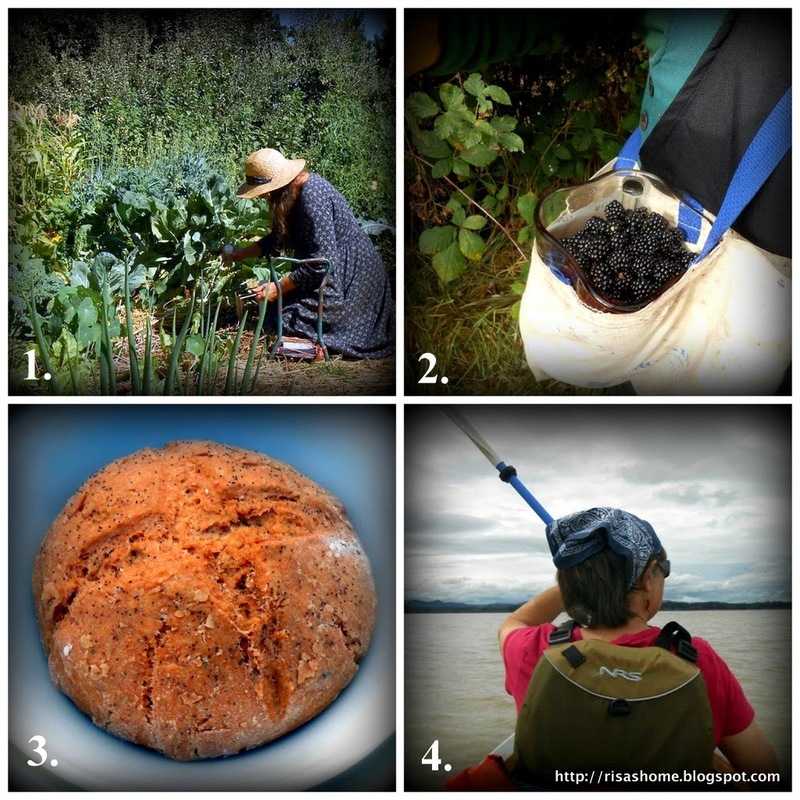 Apply self-regulation and accept feedback -- "Did you water those beans enough, honey?" "I thought I did, but now I'm not so sure." Use and value renewable resources and services -- Drying the beans in the pod, and not planting other runner beans nearby, assures us of saved seed and a productive landrace. Produce no waste -- vines are returned to the soil, beanpoles are gathered up for next year, pods will be returned to the soil. Design from patterns to details -- the trellis provides sunlight and air circulation. The drying rack provides sunlight and air circulation. Integrate rather than segregate -- the beanpoles were grown on the premises. Willow poles that sprout in the garden (none this year) are planted to make shade and predator protection for fowl, firewood, more poles, and willow water for plant growth hormones. Bark can also be used medically. Other poles (knotweed, maple, hazel) will be inspected for brittleness and the rejects will either become kindling or be returned to the soil. Tie bundles at each end to prevent warping. Use small and slow solutions -- It takes a little time to grow establish a bed with a broadfork and compost, grow and cut poles, create a seed-saved landrace along with a supply of dry beans, but you can do it. Use and value diversity -- the poles are not all one kind of wood. 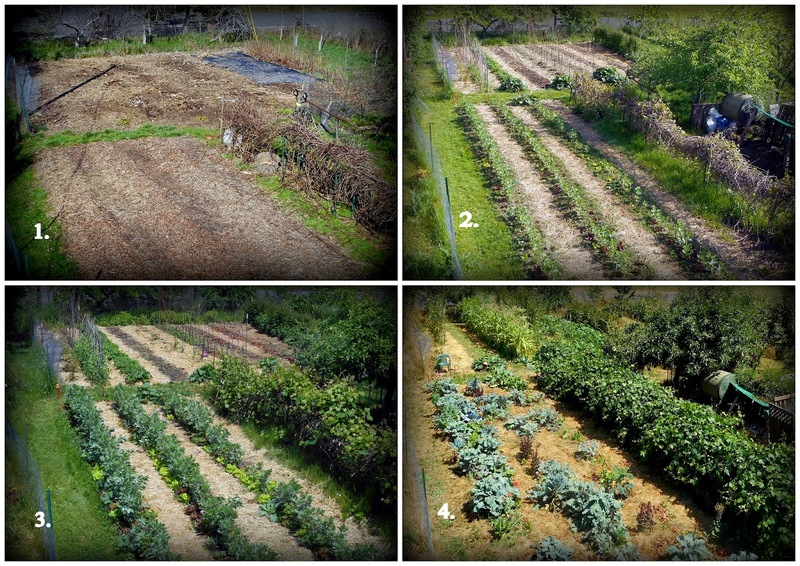 The beds are rotated and polyculture is included in the rotation. Grow many kinds of crops. Use edges and value the marginal -- The knotweed, hazel, maple and willow, along with much of the vegetation gathered for compost, grow along fence lines or the creek/dry wash.
Creatively use and respond to change -- We used to grow bush beans but we like the way trellised beans help provide relief for other beds from the relentless sun in the ongoing drought. Water is becoming an issue as we are on a well and dependent on the annual rains, so it's time to put in rain barrels. When you are done for the day, go have dinner. 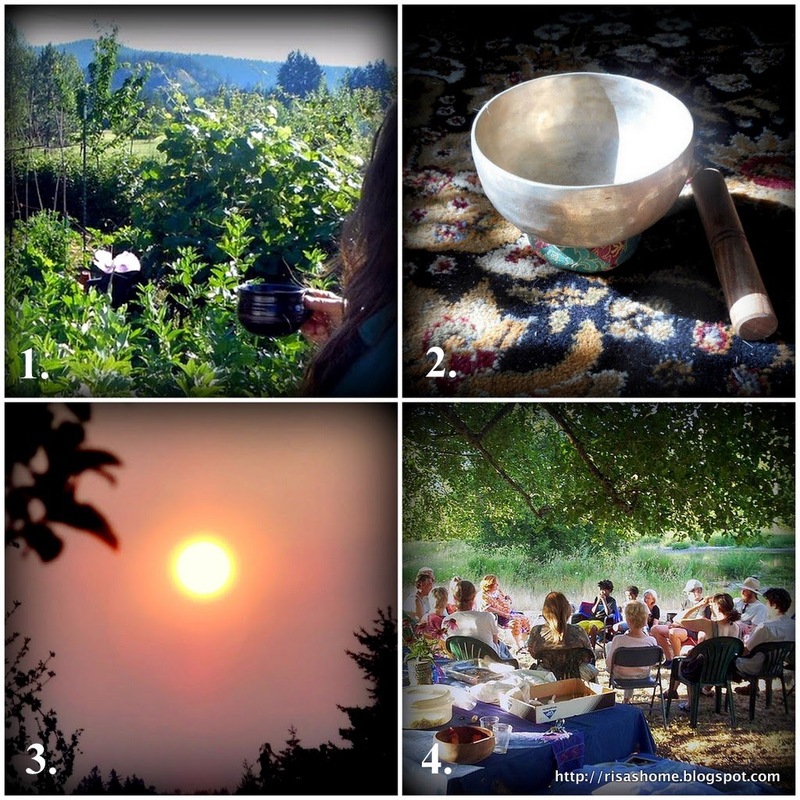 Here is one of twelve collages on The Permaculture Principles and how they might be applied, especially in the maritime Pacific Northwest. 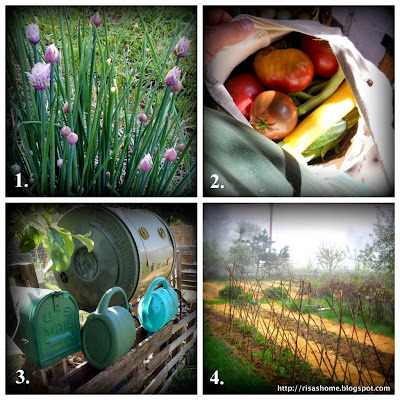 Concepts from David Holmgren's Essence of Permaculture. "Creatively use and respond to change." Four stages. 1. Broadfork 2. Mulch. 3. Drip irrigate. 4. Harvest. The current situation here is drought. More drought now, in August, than we had last year at any stage, which was more than we've ever seen at this site. So the plants are doing as well as they are, I think, because we broadforked the beds and are spot-watering a lot of the plants at their bases. Those that start to wilt get immediate attention. It is very difficult to garden right now in Pleasant Hill, Oregon. Yes, I know guilds are supposed to be helpful. For reasons I won't go into, this particular garden must be kept tree free. But I have done what I can around the edges. Also we are trellising in every other bed in the far back, which really seems to help with partially shading the beds in between. The summer squash bed and the winter squash bed I don't worry about -- they have formed a solid canopy. "Use edges and value the marginal." 1. 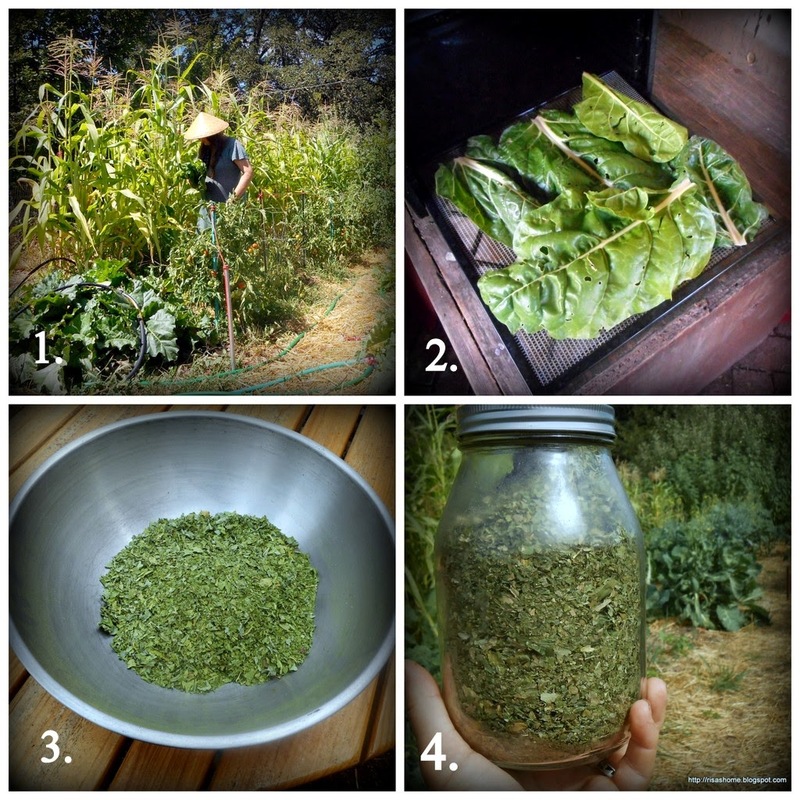 Go out to where either your greens have made a whole lot of big side foliage you don't use at table, or have gone to seed producing volunteers (volunteer chard shown), and gather about forty leaves. 2. Stuff your Excelsior or Excalibur or solar dehydrator with them. 3. When they're brittle, fish them out and strip dry matter from midribs. Clean up and crumble to desired consistency. To make powder, run the crumbled greens in a dry blender. 4. Dry can (bake) in jars and open to use as needed. Good for up to five years in our experience. Kale, collards, chard, beets, spinach, cabbage, broccoli, cauliflower, dandelions, false dandelions, lamb's quarters, turnip, kohlrabi, lettuce, and tatsoi, along with herbs to taste can all be included in this. Caveat: spinach and amaranths contain a lot of oxalic acid and so some should not consume them in quantity. 1. On the land, try everything. Some trees, perennials and annuals will do better, some will not like your climate or soils. For those who work with animals, it's much the same -- one five acre place might do well with a Devon cow and calf, whereas another, with smaller available pasture, might require a Dexter. Do early spring gardens do better here than fall? What greens last through winter freezes? What flint corn or what winter squash seems happier here? 2. Explore the native and non-native field and forest biota and geology for further utility. Are there acorns? Abandoned fruit trees, or wild plums or persimmons? Walnuts? Black walnuts? wild grapes? Edible berries, seeds, annuals, biennials, mushrooms? Which make good medicines, teas, seasonings, dyes, basketry, axe handles, beanpoles, wattles? What animals are there, and which are predators to your plants and animals, which are appropriate to hunt (if you do)? Fish, eels, clams, mussels? What's legal or illegal, abundant or under pressure and needing conservation, and what are the seasons? 3. Experiment and extend your range of skills for your own benefit and pleasure as well as to benefit your family, friends and neighbors. Can you sew, mend, design an interior, clean house, paint, plumb, do carpentry, electric, roofing, assemble hardware, install appliances, cut glass, caulk, set tile, grout, lay bricks, set a stone wall, bed a pathway, maintain tools, cook, preserve foods, bake, dance, sing, play an acoustic instrument, do martial arts, perform a play, chair a meeting, tend to the sick, attend a birth , comfort the dying, meditate, survive, evade, escape, tan leather, shoe a horse, dip candles? Or maybe only a few of these, but are willing to bank them at the community center in exchange for others? Also, when you've learned a skill, how about extending your range, trying new things with new ingredients or materials? Shown is a small loaf of spelt/rye/oatmeal bread with duck eggs, sea salt, veggie crumble, and brewer's yeast, baked in a crock pot. Next, perhaps we'll try in a Dutch oven on a rocket stove. "Use small and slow solutions"
Holmgren and Mollison began developing the Permaculture Principles in the era of publication of E. F. Schumacher's Small is Beautiful: A Study Economics as if People Mattered. Recommended, especially the chapter on "Buddhist economics." The Permaculturist is enjoined to consider edges and diversity partly because foraging is more sustainable than farming, and one place you can forage is in the garden! This year we have an abundance of chard that came up on its own as a result of our having let a plant go to seed. It's doing better than any of our transplanted greens. 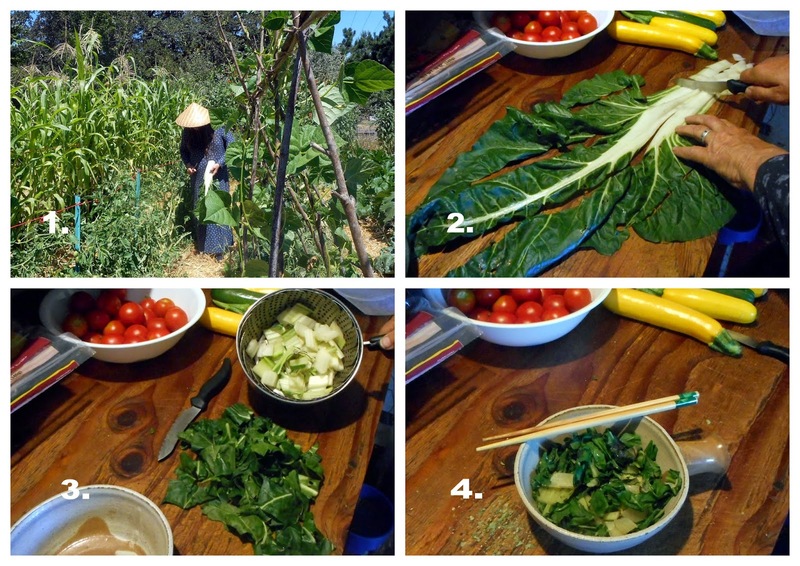 One leaf meal: volunteer Fordhook chard. 1. Cut and bring in. 2. Wash and cut up. 3. Steam stem pieces 20 min. 4. Add leafy green pieces and steam 10 min. Salt and butter to taste and serve. 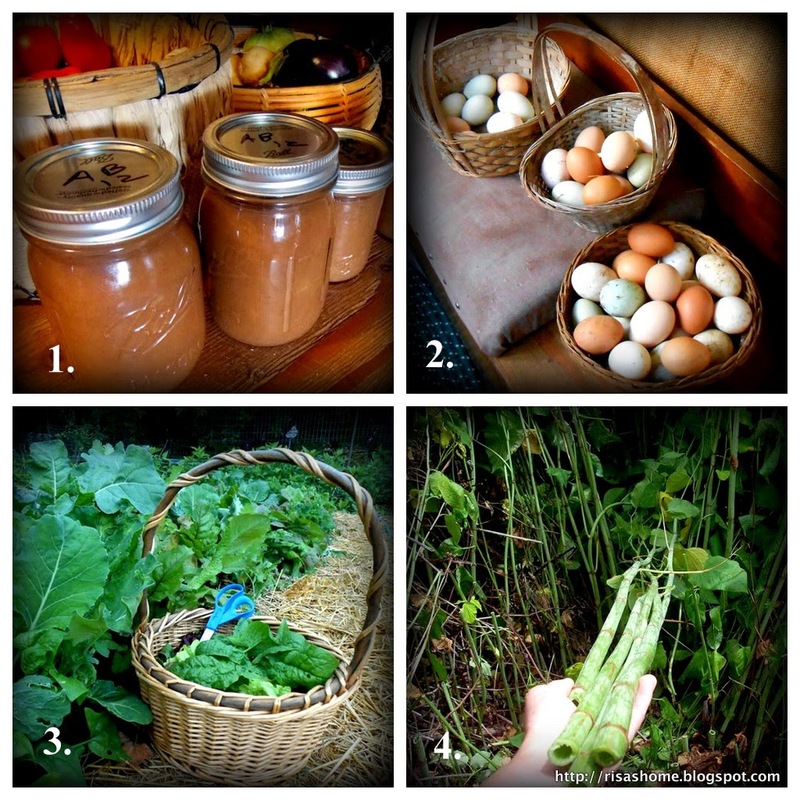 Making a meal from something that "just came up" is even more local than your CSA. Think of the ways that fits into "Earth Care, People Care, Fair Share." Invite the neighbors to have some and you will really be on a roll. Fordhook dates from the 1920s and was a Burpee developed strain. The stems are to my mind even better than the greens. Transplants well. Does like well composted loose soil and lots of water. Tolerates both sun and shade and lasts through most of our summers and most of our winters. Seeds prolifically and volunteers grow true to form. Seed companies say it grows to 18" high but they are being modest. Many specimens over three feet not counting those that bolt in heat waves. Create efficiencies and resiliences (Yin and Yang, if you will). 1. This is the poultry moat/orchard, an example of function stacking. Outside fence, slowly becoming a hedge that yields blackberries, plums and wild cherries, is a woven wire deer fence for excluding deer, coyotes and stray dogs from poultry area and garden. Inside fence, lower left, is a welded wire poultry fence and keeps poultry out of the garden until wanted. Fruit trees are planted on a north-south axis to shade one another's roots. They also provide shade to poultry as well as protection from glide-path predators. Poultry pick up fallen fruit and predate on slugs, snails and insects headed for the garden, drop some fertilizer. Chickens, ducks and geese have overlapping but not identical dietary interests. 2. Polyculture; species mixing. Different perennials and annuals mix it up in some beds with a range of heights and leaf and root patterns, allowing some plants to look for slightly different nutrients and water profiles than others, varying sunlight and shade, hiding some plants better from their predators. We never got the hang of companion planting charts but sometimes we get lucky! 3. Variation in height; trellised crops alternate with low-growing spreading crops, assisting each other with partial shade, moisture conservation and weed suppression. "Design from pattern to detail." Four views by evening light. "Permanent" and temporary structures, walkways, paths, beds, guilds, garden architecture, pastures, woodlots, shade, sun, and wildlife corridors should interlock to the advantage of all concerned and also reflect your own needs, movements and temperament. Know in what direction are summer and winter sun and shade, where the weather tends to come from, and the state of your soil and watershed. (I would add first and last frost, but who knows, these days?) Remember humanity is a heat engine and way over energy budget: what are things you can do to lower the cost to others of your short time here? The buildings shown here, for example, are insulated, shaded, and have white walls and roofs. Many of their materials are recycled and recyclable. 1. 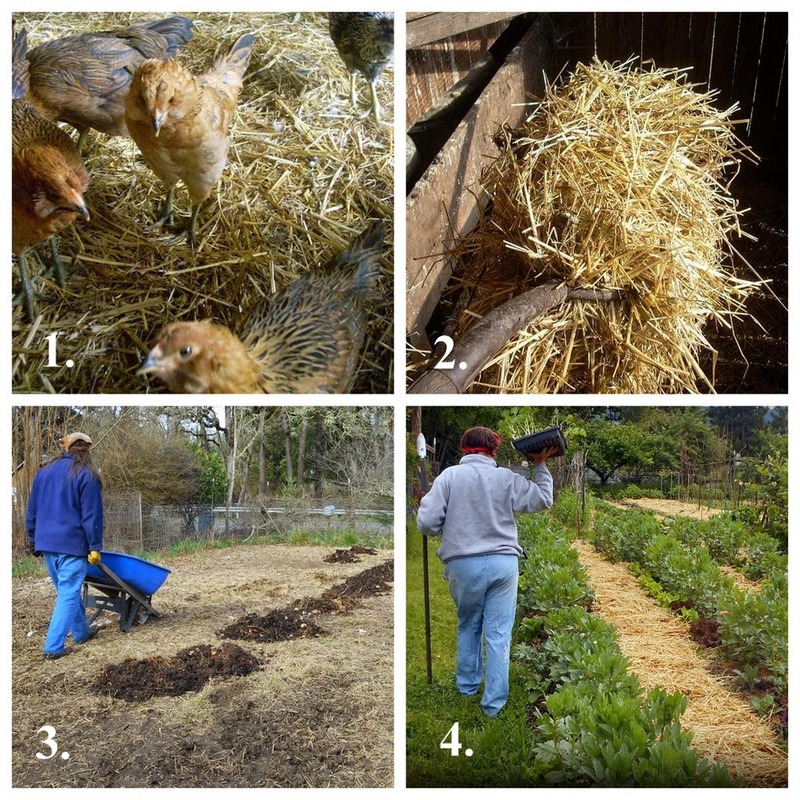 Gather barn bedding, leaves, grass clippings, kitchen wastes, aged humanure, woodlot waste -- anything that is compostable, does not pass along disease, undesirable chemicals or plastic. 2. Heap and turn, or bin and worm. There are good texts on ways to do so. Keep under cover in rainy weather to prevent leaching out. 3. Distribute. Make enough to feed all beds, or it may be, pots. Consider using more where crops are hungry feeders, but give something to all soils if you can. 4. Reap the rewards ("Obtain a yield"). But remember to return all wastes -- leaving roots intact to rot in place, for example -- either by chop and drop, or carrying them to the heap or bin. If there are wastes that must be burned due to disease or pests, consider returning the ashes at least. During the off season, if you have one, consider allowing stock (in our case poultry) access, to eat up pests and weed seeds. Meanwhile, start all over at 1. Let your soil's seasons be to you like your days, with an awakening, sustenance, productivity, and rest. "Use and value renewable resources and services"
My first thought when contemplating this principle was the adage: "reduce, renew, reuse, repurpose, recycle." And you do see some of that here: at 2. the harvest/forage bag has been made from a conference tote bag by snipping the handles at one end and sewing them to each other to make a shoulder strap, while at 3. the compost bins are made from pallets and the mailbox is repurposed as a rain-proof hand tool bin. But it also means to let the earth gift you with things you may use and then return to the earth. 1. Perennials give and grow back, just as trees offer fruit and nuts and then offer them again. 2. Annuals provide fruit and veg but also seed, so that they may come again. 3. "Wastes" become compost gold. Water goes onto the soil, then out to the sea, becomes clouds, returns as rain and snow. There's really no such thing as waste -- the continental plates will subduct all. What there is is spoilage -- making the things you have used into things that are (in the nearer term than geologic processes) harmful or unusable for others. On a grand scale, the Pacific Garbage Patch would be an example of such spoilage, or the Love Canal, or whatever has been touched by the Tar Sands or nuclear industries. Closer to home, lead paint, Roundup usage, or motoring to the store with a V-8 to buy cigarettes, say. Watch what happens to the stream of gifts from the Earth you sample. Where do the beanpoles go? The apple cores? The old fence boards? "Apply self-regulation and accept feedback." Efficient or resilient systems require noting and correcting inefficient or non-resilient practices. My old anarcho-syndicalist labor cooperative, The Hoedads, ran on Robert's Rules of Order, but also appended to the end of each meeting a session borrowed from Communist Party committee work, known as "Crit-Self-Crit." We would each rise in place and air a grievance we had with anyone, or clique, or the whole team, followed by a grievance we had with our own performance. Dialoguing was not permitted; one had to wait one's turn and even then responding to a specific criticism, other than to contribute to a solution, was discouraged. In this way we had time to consider the viewpoint that had been expressed, and perhaps acknowledge the truth in it and rise to the moment, making a public and private commitment to do better for the sake of all. Solidarity is People Care. 1. Ask your site what it wants from you, through close observation and interaction. Watch the seasons and learn. 2. Contemplate what you have seen and learned in a place and state of reflection. 3. Observe what is happening off-site as well, remembering that everything affects all. Here we see smoke from tundra and taiga fires over a thousand miles away. What does this mean for the world? Your region? Your locality? Your site? How should you respond? 4. Check your findings with others and be prepared to discover, in everyone's accumulated wisdom, your mistakes. Freely acknowledge these when they have been confirmed -- this too adds to the pool of knowledge. This principle is quoted a lot in the context of PDCs, or Permaculture Design Certification courses. In short, pay the teacher something. I'm not against that (I support it), but until more designs actually provide the landowners with a living rather than just expensive landscaping, the twelve Permaculture principles will make slow headway in a world that is running out of time to implement them and thus save itself. What's the holdup? BAU (Business As Usual). BAU does not like the systems analysis approach on which Permaculture is based, and defunded Systems science during the Reagan years. 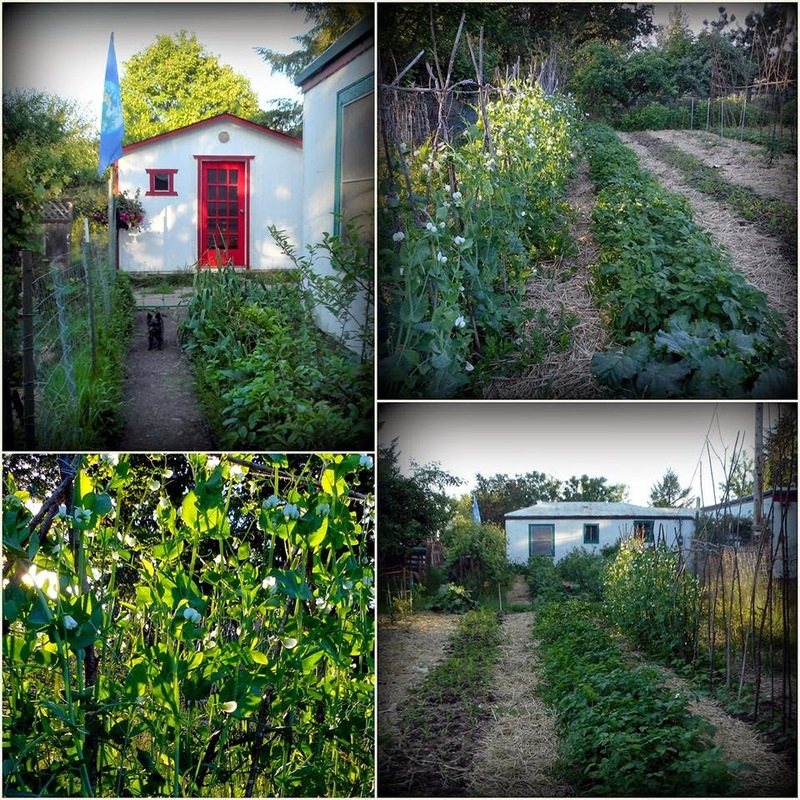 In the BAU growth-for-the-1% economy, run by the likes of Monsanto and Walmart through bought officials, land will remain expensive and the majority of those (largely trapped in cities) who most need what Permaculture could theoretically do for them will regard it as impracticable and out of reach. Those who wish to and can go WWOOFing or join an ecovillage or buy a small acreage and build a CSA should do so and not wait for the post-civilization agrarian revolution (assuming there will be anyone left to do that). For the rest of us, I propose a smaller model: grow something, however small, and give it away. Next, if your day job is no more than living on the minimum BI provides, and you are able-bodied, go volunteer. I would encourage as many as possible to spend their days urban farming, as my autistic son who is on SSI does -- in his case for a food bank, which would be less necessary under BI. For the rest of us, who would then use BI as a springboard to some form of entrepreneurship or who already have a day job, all so inclined and able might consider doing our Permaculture on the scale appropriate to our means, be it one potted lemon tree. This might be Craft, alternative energy production, infrastructure maintenance, search and rescue (your favorite activity here), or microfarming. It is traditional for women in the Vietnamese diaspora (and so probably back home as well) to work at a job or the family business until retirement age. 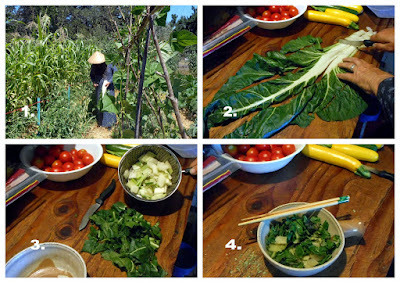 Then they turn to the back yard to assure a supply of fresh vegetables for the family. They grow the things they do well, and trade with friends and neighbors. They are "obtaining a yield" yet do not subject themselves to BAU's punitive regulations on small/organic farming and small business commerce, or to BAU's regressive taxation. 1. Tomatoes, squash, eggplant, apple butter. People may not care for most of your home canning, but they will eat your apple butter. 2. Duck eggs and chicken eggs resting on a foraged bench. 3. Greens being harvested for fresh consumption, for poultry, and for dehydration for later use by both humans and poultry. Our budget at Stony Run Farm hasn't been up to what often comes to mind with this principle, which is a set of solar panels. But we do in fact catch and store energy. 1. A 3X50' bed of potatoes stores a lot of solar energy in the form of a wheelbarrow full of spuds. We eat about two thirds over the winter and then plant the rest the following spring. Rotating beds seems to help reduce the risks associated with using your own spuds for seed. Ours are Yukon Golds, Reds, and German Butterball. 2. We do buy in some wood for each winter but also manage our own coppice and woodlot. This is another form of solar, similar in principle to the potatoes (photosynthesis). One warms you on the inside, the other on the outside. Splits, rounds and smallwood go in the woodpile, which faces the sun to season the wood. Leftover branches and twigs, such as the pine boughs shown, are treated as chop-and-drop mulch material, scattered around beneath fruit trees or incorporated into the garden beds. One heap of twiggy "waste" is left for a wildlife safe zone. Many of the trees in our rotation we planted ourselves. Saw used here is electric, and we buy 100% wind from our co-op. 3. 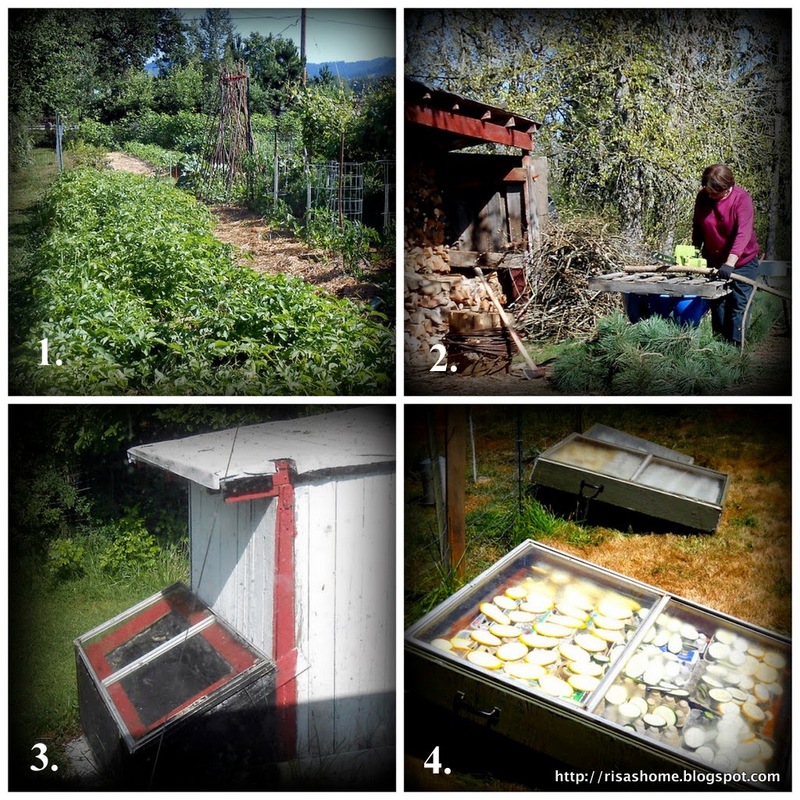 We also use passive solar in the form of a used hot water heater with its jacket and insulation peeled back and painted black, resting on a pallet inside its own cold frame. It's tapped into the main line between the well and house, and serves as a pre-heater for the inside electric hot water heater, reducing costs half the year. In two decades it has never needed maintenance. In recent years we have, by whatever causes, had fewer infestations here of insect pests, slugs and snails. Perhaps one reason is that we keep an eye out for ways to encourage predation of these. 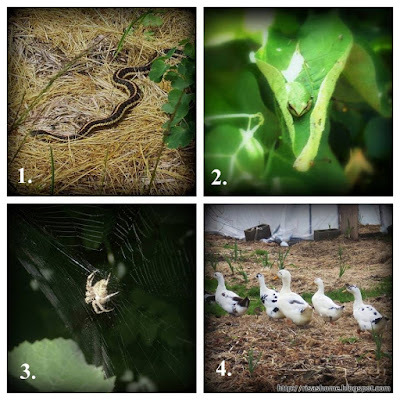 By maintaining habitat refuges, we're seeing an increase in 1. garter snakes and gopher snakes, 2. tree frogs, and 3. orb weavers, yellow garden spiders, and barn spiders. 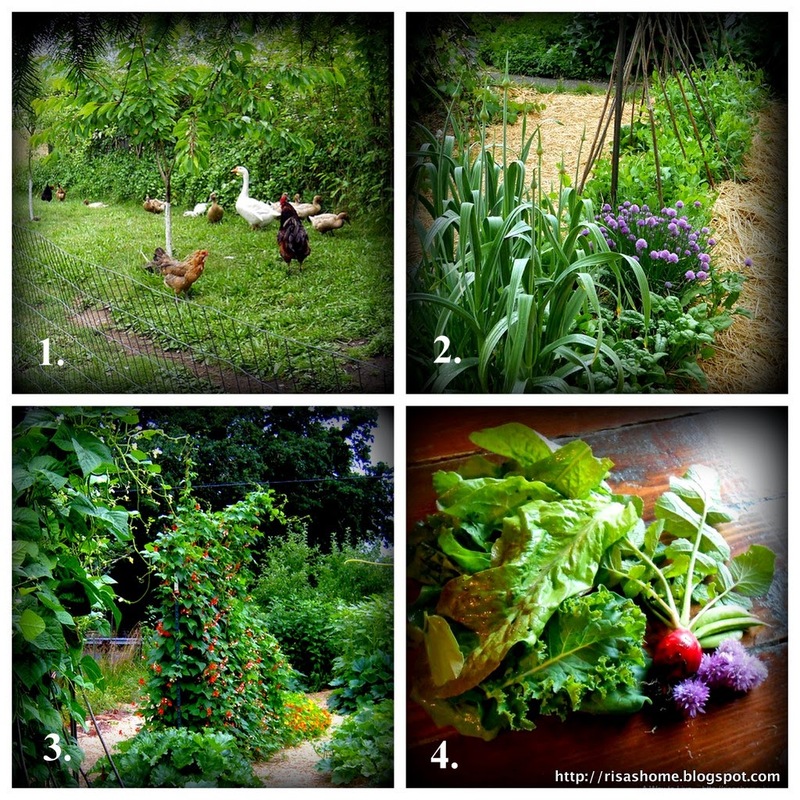 Also, we encourage 4. the ducks and chickens to spend time in the garden and orchard, especially in winter. When we find a ladybug or other beneficial on our walks, we bring it home if it seems okay to do so. Through observation we can adapt to some changes. For example, we spotted a trend in increased supply of plantains, amaranths and false dandelion on the premises. We looked these up and ended up adding them to our diet and using the plantains for topical medication as well. Bigger changes are leading us to other thoughts. Poison oak is on the increase, showing up on level ground and not just in the trees as formerly. We think from this, and hearing that rattlers are also extending their range, that our climate is drying and may affect the well, as our limited groundwater is seasonal-rains dependent. We can collect rain and drought-proof the garden somewhat, but may also need to add a water barrel and rotary pump for visits to the river, less than two miles off. We're nearing the end of our career here, but there's no point being driven off the place prematurely through lack of observation and interaction.